Welcome to the new home for the Chuck Miller Creative Writing Service, a collection of articles, features and photographs that I have written, snapshotted and published since 1991. I hope you enjoy these articles and find them informative. Currently you may click on any of the links below, to bring you to a series of articles and features. Enjoy. CHUCK THE WRITER'S NEW FICTION BOOK, THE ROBINS OF IVERHILL, NOW AVAILABLE FOR PURCHASE!!! The Robins of Iverhill: A Minor League Baseball Fairy Tale, my first full-length fiction novel, was originally written in 1985 as part of my senior college thesis. A quarter of a century later, I found the original manuscript, edited it, and serialized it in my weblog. And now, the book is available to order through Amazon, via CreateSpace. The story, a fictional account of a low-level minor league baseball team and the disparate identities and goals each of its players face, can be ordered by clicking the advertisement on the right side of this webpage! CHUCK THE WRITER'S NEW ART BOOK, GHOST SIGNS OF THE CAPITAL DISTRICT, NOW AVAILABLE FOR PURCHASE!!! They're faded advertisements of products sold 100 years ago. 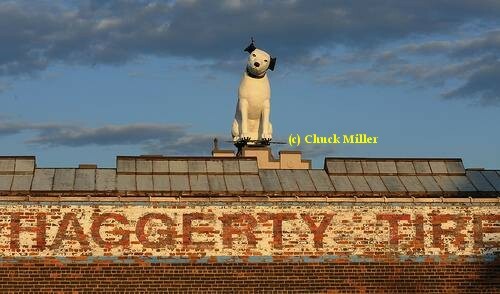 They still exist on buildings and facades throughout Northeastern New York. They're "ghost signs," advertisements that are part of city skyline, barely noticeable unless you happen to look up. And now they're captured in Chuck Miller's first photography art book, "Ghost Signs of the Capital District." You can order a premium copy by clicking the Blurb.com advertisement on the right side of this webpage! CHUCK THE WRITER'S PHOTOS NOW AVAILABLE FOR PURCHASE!!! Click here to see the gallery and purchase photos for your wall or office!! RIBBON, 2009 New York State Fair, "Action Under the Basket"
"Redlines, Orange Tracks and Blue Streaks,"
"PLAYING AROUND WITH CHUCK MILLER"
C.W. McCall, "Convoy Rides Again" - AWARD WINNER!! Highway Inspections - What do they want from you? Yes I am an award-winning professional writer. Click the link to see proof! All articles and text on this website are the property and copyright of Chuck Miller. No unauthorized use of this text (including copying information for an internet auction or a fan page) is permitted without the expressed written permission of Chuck Miller. A single link may be provided on a person's homepage or in an internet auction, provided that the reference "From the Chuck Miller Creative Writing Service, http://www.chuckthewriter.com" is listed with the link. Please contact Chuck Miller at the e-mail address listed above if you would like to quote or copy information from this site.